The common fungal pathogen Athelia rolfsii (syn. Sclerotium rolfsii) causes a basal rot to stems and petioles of herbaceous plants. We've seen a few samples of hosta and anemone infected with this disease so far this year. This pathogen can rapidly spread under favorable environmental conditions, so it's important to scout plants and catch the disease early. Leaves will rapidly wilt, then turn yellow and become necrotic. Distinct lesions will not be seen on the leaves as the fungus is infecting the base of the plant. 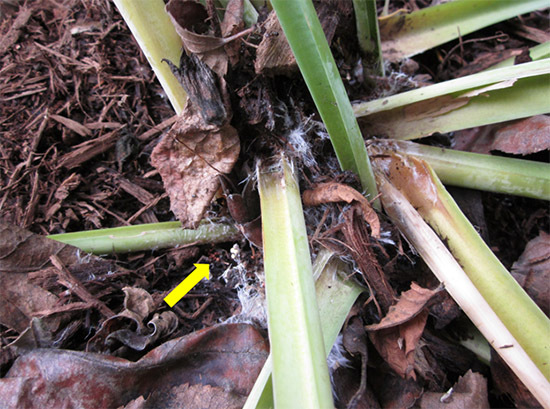 This also means that infected tissue (leaves on hosta, stems of other plants) can easily be pulled from the ground. Often white, fuzzy mycelia (fungal strands) will be visible along the soil surface, along with small, round, light yellow or tan structures known as sclerotia. Hosta with white, stringy mycelial growth. The small, light orange and tan balls indicated with the yellow arrow are the sclerotia, or overwintering structures of the fungus. A. rolfsii can be a devastating pathogen. This is partially due to the fact that it can survive for months or years at a time in soil, and partially due to the fact that it has an extremely wide host range with over 500 plant species susceptible including ornamental flowering plants, foliage plants, fruits, and vegetables. Warm, humid environmental conditions trigger the germination of the sclerotia and infection soon follows. In severe cases, entire beds may be infested with different species of plants all succumbing to the same disease. Management consists of trying to exclude the pathogen, reducing conditions that favor the disease, and removing infected plants. Carefully examine plants before installing them in the landscape. Contaminated plants, containers, equipment, and soil can all spread the pathogen. Heavy mulch layers around the base of plants appears to aid in overwinter survival, so removing mulch from the base of plants in late fall in areas that have been affected by white mold is recommended. If infected plants are found, they should be removed from the landscape. Place them in a plastic bag, seal or tie off the bag, and remove it from the area; do not compost or mulch infected plants. The top several inches of soil around the infected plant should also be placed in the plastic bag and removed.